-Undershirt is white or off-white, sleeveless with a V neck cross over. Optional: blanket stitch on edges. Tunic is brown with a raised diamond-shaped pattern; the screen accurate fabric has the weave laid over the base material and sewn to the base material. a. The front of the tunic wraps right over left. b. Below the waist, the tunic splits into 4 panels. The front panels overlap in the front, right over left. The panels lay flush against each other on each side and in the back. *The tunic ends at mid thigh. -Optional: Yoke at the back of the tunic at or just above the shoulder blades. -Obi is a dark grey fabric (slub cotton, linen, or similar recommended), about 2 shades darker than the tabards/wrap dress. -Obi is between 5 to 8 inches wide (proportional to wearer) with some horizontal creases/folds. -There are no visible closures on the obi. -The obi is worn over the tabards/wrap dress and under the belt. -The wrap is a grey colored thin (gauze or gauze-like) material. -Wrap is gathered at the shoulders, and crosses over the breasts in the front, with the right side crossing over the left. In the back, the wrap does not cross. -It wraps as one continuous piece (no visible seams). -The loop of the wrap fall to the lower knee on the costumers left. The loose ends of the wrap fall on the costumer’s right side, with the front falling to below the costumers knee, and the back of the wrap falling to the costumer’s mid-calf. -The tabards/wrap dress is worn under the obi and belt. Hair is approximately shoulder length with small pony tail at top of the head (two small wraps 2 inches apart preferred); no bangs; naturally occurring hair colors only (brown preferred). -Belt is a Brown to dark brown weathered belt. -Belt is constructed of one continuous piece of leather (or leather-like material) that splits into the two belts. The joined portion is on the wearer’s left, and the separated sections and belt closures are on the wearer’s right. -Belt is secured with two d-rings or rectangular metal rings on ends. -Twine wraps around the belt near the split on the front, and on the lower belt only in the back. -Belt is approximately 2 inches at the top and 1.5 inches at the bottom (approximately 3.5 inches at the conjoined part, proportional to the wearer) The top section must be wider than the bottom. -Belt features tabs that weave into the back of the belt to hold firmly closed. -Pants are a light gray to taupe in color and lighter than the wrap dress/tabards. -Pants feature two darts on each side of the knee and a wrapping seam at the top of the knee and a straight seam at or just below the knee. The lower seam does not continue around the back of the leg. -There is a single vertical seam goes from the the top of the arched seam to the top of the leg. -Optional: top stitching on both sides of the vertical seam. -Armwraps are made from an off-white colored gauze bandage or rough-textured fabric. -Arm wraps are weathered, with the edges of the wraps off-colored and darker than the base wraps. -The wraps are tight to the arms. -The wraps begin at the bicep and extend to the wrist. -The bracer is a medium to dark brown with a slightly lighter brown inset. -The bracer is worn [/b]on the costumers left arm. -Boots are a brown leather or leather-like material. -Five leather hooks hold the laces onto the back of the boot. -The soles are dark colored. -(Optional but recommended: The boot features a front center seam that endsat the lower section). -brown leather or leather-like holster attached to belt. -Holster is simple and void of decoration. (Optional: 2 metal studs/rivets secure the leather in the front). -Narrow thigh strap wraps around costumers right leg. -A blaster is not worn with this holster. 1. 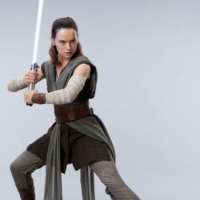 Rey’s Lightsaber (Skywalker graflex.) Lightsaber must be replica quality and accurate scale. Plastic toys will not be approved.